This look is definitely more urban like, but it includes my favorite pieces. This beautiful jacket is one of my shopping findings I bought when I was in Frankfurt, I love the sheer material and the roses! Even if it's colorful, it's still dark and I fell in love with that floral rose print. And yeah - I'm wearing the RADEST sunnies ever. These are SO cool and I always enjoy the people looking at me when I'm wearing these sunnies. My cropped blouse adds a quite chic touch to the whole look and my studded and shredded denim shorts make it look more grungy and punky. The days are getting shorter, the nights colder - fall is coming. The leaves begin to change their colors and there are more often stormy, rainy days. Slow but steady we have to say goodbye to our summer clothes and I already can imagine how much I will miss my airy kimonos, cut out and cropped tops, floral crowns and shorts without wearing tights underneath. But: the FW campaigns by Saint Laurent, H&M, Inditex or other labels are so exciting and I'm already looking forward to buying and wearing those cool clothes soon. 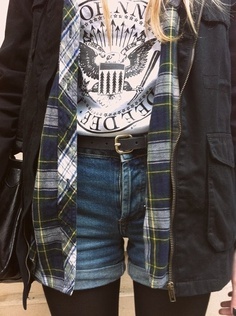 Obviously and frankly Grunge inspired clothes will be a huge part of the store's ranges. Plaid / tartan patterns, heavy biker boots, studded jackets, velvet materials and cozy boho print cardigans - definitely my type of clothes I'm going to wear in Fall/Winter. Wearing cozy cardigans and flannels together with velvet and floral dresses or simply shorts and a tee together with tights I already did in summer. And of course: Layering, layering, layering! Here are some pictures which already inspired me - and maybe will inspire you, too. Maybe the farewell to our summer wardrobe won't be that hard, right? May I introduce you to one of the radest dresses I ever owned? This cool dress I got from Motel which is an amazing and trendy label from the UK has become one of the best clothes to wear for the upcoming fall in my closet. 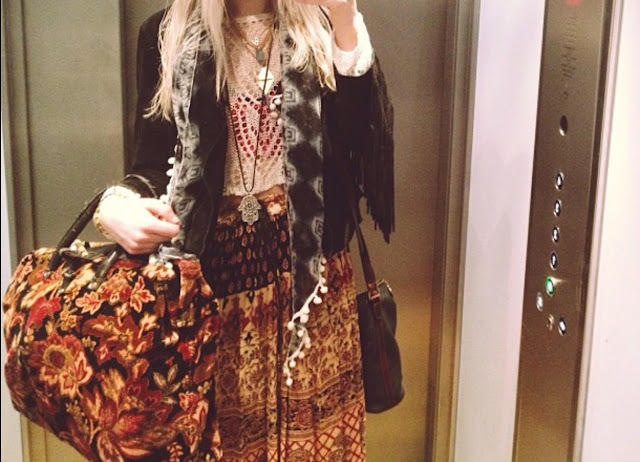 It's colorful, edgy and kind of spiritual/hippylike which looks great together with a warm jacket and tights. Especially in fall when the colors are darker and warmer (bordeaux, grey or black shades) that dress is the perfect contrast. It's still festival like and reminds of summer even if the weather is not that hot anymore. I decided to combine it with my most loved leather jacket studded all by myself, black pattern mesh tights and my green tinted sunglasses which fit perfectly the color of the bottom of the dress. Hello again to all my friends, together we can play some Rock 'n' Roll. As soon as I saw that dress it was love at first sight. It's from Lashes Of London , an amazing brand from UK, you really should check it out! It's quite new and their clothes are beautiful with great quality, too. When I'm wearing that dress, I always kinda feel like Alice in wonderland! The print is dreamy, romantic and I love the colors which reminds me of an enchanted flower garden. I also wear my new favorite "Faith" necklace. I already saw some of those labeled statement necklaces in the magazines about the AW 2013 fashion shows and they caught my eye. "Faith" is definitely something you should have in life. Faith in yourself! My very first maxi skirt, I hadn't owned one before, because I didn't found one I really liked. Most of the maxi skirts are too boring or make you look like you've gained 15 pounds. Then I got this one and I love it. I love its fit and print so much, it's edgy and looks different when you compare it with the maxi skirts you usually find in stores like the plain colored ones, aztec print ones and so on. When I saw this one at Urban Outfitters a couple of weeks ago it was love at first sight haha. 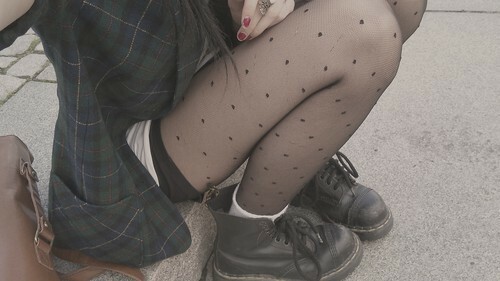 I wear it together with my favorite harley davidson crop tee and my all time worn Doc Martens Darcie boots. It's also perfect for fall, then I'm gonna wear it with my favorite leather jacket, tights underneath and my feodora hat. Times are looking grim these days, holding on to everything. Rock 'n' Roll meets Boho/ethnic - that's how I would describe my outfit for today. I'm wearing my lovely denim waistcoat I bought at Tally Weijl half a year ago. I love denim waistcoats, because they really go with everything, keep you warm when there are colder summer days and they're a typical Rock 'n' Roll piece. The denim vest I'm wearing has also a cool acid washed print and destroyed effects which make it edgy. I choose my fringed cropped biker top from Topshop I got on a secondhand website. Furthermore I'm wearing my amazing elephant ethnic print leggings I got on sale at Urban Outfitters. I love elephant-indian-ethnic prints so much, I seriously can't get enough of them. I already have a small collection of boho/vintage looking pieces with an edgy pattern. Your memories will always haunt me like a ghost. Southwestern like - my choice for today. I always love embroidered peasant blouses, but when I came across this dress I bought it. I like the fact that it's a black dress, usually peasant blouses - or dresses - are usually white with a black pattern, but I prefer the black one with a red/white pattern. It's quite warm when the sun is shining, though haha. I wear it together with my vintage hat, golden jewelry and my boots from Zara's spring '13 collection. My golden eagle cuff was a present from my parents for finishing my school year a year ago. I totally love it, it's one of my favorite pieces! You can see my favorite summer dress and I've already worn it many many times. It was on sale for only 45€ at Urban Outfitters and I immediately fell in love with its vintage print. It's boho, it's cute and it's perfectly fluttering, that's why I prefer wearing it especially when there are 30°C and more outside.